This is a die-cut flange Lundy Fence porcelain sign. This particular Lundy Fence porcelain sign is orange with black and blue text. 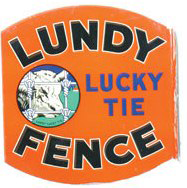 It reads, “Lundy Fence, Lucky Tie” and features a colorful section of fencing on the left side of the sign.